Disabled & Handicap Signs by Street Sign USA! 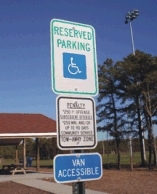 Street Sign USA offers a large selection of Handicap Parking Signs. We also carry state specified disabled signs designed to meet your state's code along with plenty of fine signs & plaques. Post an optional plaque for accessibility or warn them of a potential fine.